Dubai: Private sector economic activity in the UAE gained momentum in March with both business output and new orders increasing at a faster rate than in February, with output rising at the fastest pace since August 2018. Emirates NBD Purchasing Managers’ Index (PMI) for the UAE rose to 55.7 in March from 53.4 in February, signalling a strong rebound in economy. “After a surprisingly weak February reading, it was encouraging to see the headline PMI recover to a 55-handle in March. 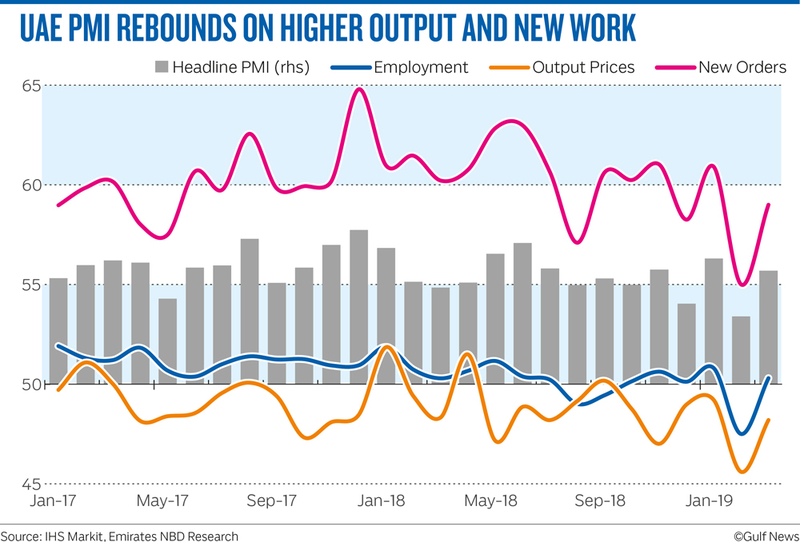 The acceleration in output and new orders suggests that demand has improved, although this was likely supported by further declines in selling prices in March,” said Khatija Haque, Head of MENA Research at Emirates NBD. The growth in inventories, together with a rise in the future output component suggests that businesses are more optimistic about their prospects. March data showed new orders increased at a marked pace, with growth in line with the series average. Some survey panellists suggested, however, that discounts were offered in order to secure sales in a competitive environment. Output prices decreased for the sixth successive month in March. Competitive pressures were also evident further up supply chains, with firms’ purchase costs rising only slightly. 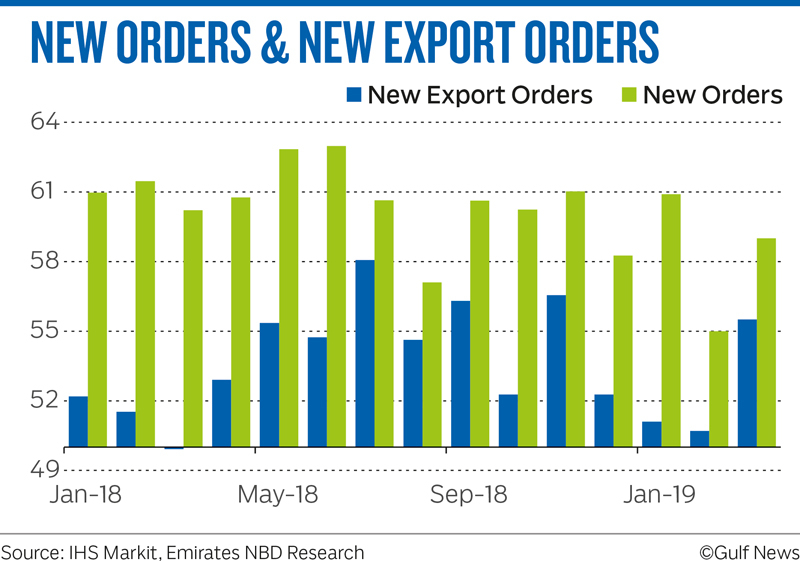 The rate of expansion in new export orders quickened at the end of the first quarter, recovering from February’s 11-month low amid reports of greater new orders from other GCC countries and the US. Higher customer demand and successful marketing fed through to another monthly rise in business activity. The rate of expansion quickened from February and was in line with that seen in January. “The environment remains competitive for businesses. Employment was also marginally positive last month, although fewer than 3 per cent of firms surveyed reported hiring in March. The growth in inventories, together with a rise in the future output component suggests that businesses are more optimistic about their prospects than they have been in recent months,” said Haque. Despite the slow growth, employment levels stabilised in March, having fallen solidly in the previous month. Higher new orders encouraged some firms to take on extra staff, but others maintained cautious hiring policies. Backlogs of work, meanwhile, increased at the slowest pace for a year. Non-oil companies raised their input buying at a near-record pace, while the pace of accumulation in inventories also picked up. New order growth in the economy was supported by a sharp recovery in new export orders, which had seen little change over the prior two months. The average PMI reading for the first quarter of 2019 is 55.1, only slightly better than the fourth quarter of 2018 and lower than the first quarter 2018. “While the March reading is encouraging, the data over the last three months does not yet point to a rebound in non-oil GDP growth in the UAE. However, we do expect faster growth in the non-oil sectors this year relative to 2018 (preliminary official estimates put 2018 non-oil growth at just 1.3 per), as construction and infrastructure projects are completed ahead of Expo 2020 and increased government spending announced last year kicks in,” said Khatija Haque, Head of MENA Research at Emirates NBD.